UK supermarket chain Tesco has begun replacing the female voice used on its self-service checkouts with a male voice sparking a sexism row on Twitter. 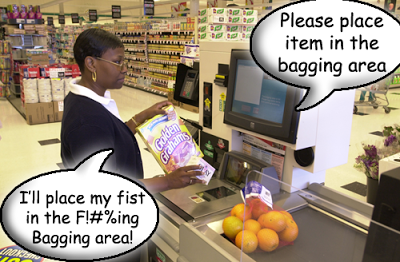 The female voice, recently identified as former Eastenders actress Helena Breck, has been used in Tesco stores at the self checkout for over ten years now and is infamous for its catchphrases which include “unexpected item in bagging area”. The quotes are intended to be welcoming and advising when a customer wants to beat the manned checkout and save time by scanning their own purchases. But often the opposite is true and the voice is known for being coarse and abrupt with the same level of charm as a T-800 cyborg attempting to crack a smile. Tesco says the new male voice is “friendlier, more helpful and less talkative” than the ‘irritating’ female predecessor and uses much softer tones with new phrases such as “this can now be placed in your bag” and many have taken to Twitter to poke a bit of fun about the self-checkout’s gender-reassignment. Some others, however, have taken it a bit out of hand and are accusing Tesco of being sexist. The new self-checkout voice is believed to have been recorded by Cheltenham-based voice-over artist Andy Turvey who has previously recorded a Santa Claus voice for use in Tesco stores at Christmas time and whose vocals also appeared on several Nickelodeon kid’s shows. Tesco is yet to confirm this information but the voice can now be heard at a handful of stores in the UK. Try scanning your goods this lunchtime and you might get a pleasant surprise!